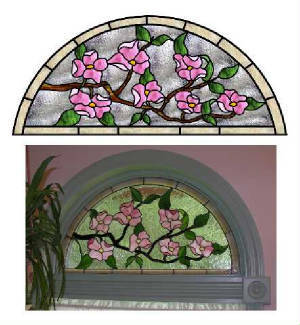 For personalized attention or to answer any questions you may have about commissioning a stained glass work of art, please call us. Our phone number is 845-876-3200. 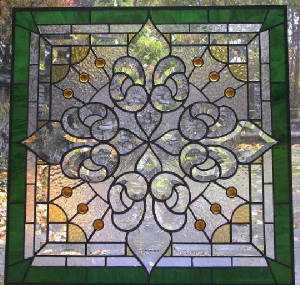 You can also CLICK HERE send us an email so that we may call to discuss 'your' stained glass inquiry with you directly. The images on this page show some details as to how we work on our commissions using Glasseye 2000 software. We create our designs on the computer and are able to email the images for design review and discussion. 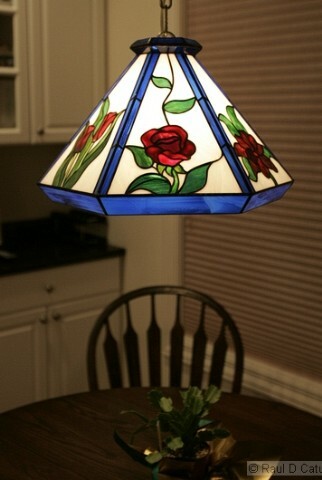 Please note how exact our designs are to the finished piece. 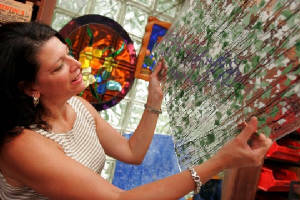 Selecting the perfect piece of glass. Shown here is hand-rolled confetti and streamer glass. During the design phase, we create the drawing and show some options for color. The finished panel with clients final color selection. 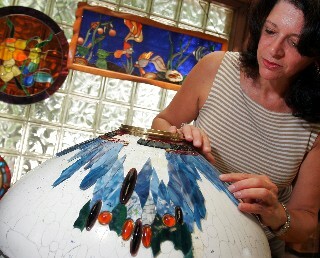 Assembly of a Tiffany Reproduction - Dragonfly Lampshade. Intricate cut pieces are fitted to a fiberglass mold before being foiled and soldered in place. The pattern is drawn directly on the mold. 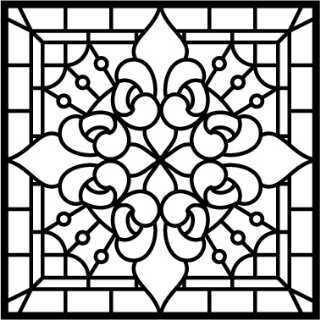 We can design a panel and super-impose it on a photo of the actual window to give our clients an idea of how the design will look, along with our glass color recommendations. 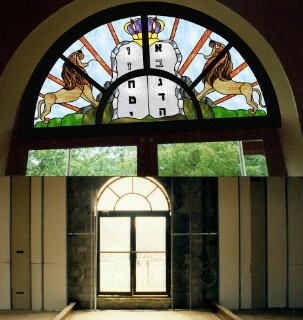 This aspect of our service allows clients to better visualize how the commissioned piece will appear when completed. For clients who are out of town, we are able to email these images to finalize all the details. 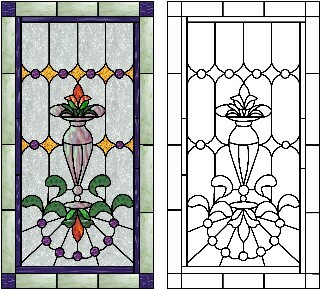 This panel called for beveled clusters and border details which were easily downloaded into the Glasseye 2000 program. 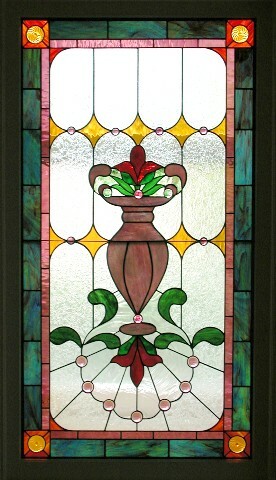 "Action Bevels" is the manufacturer of the fleur du lis clusters which can be seen in the completed window to the right. 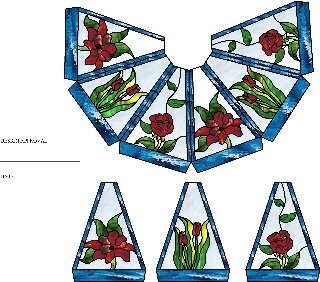 Design layout for commissioned 6 panel lampshade. Ready for client approval. The approved design above. The installed panel below.